The length of the Summly is also determined by the size of the iPhone model, so iPhone 5 users will see more text on their 4-inch screen than users of the 3.5-inch iPhone 4S. "What we believed is news on the iPhone-sized screen is currently broken," D'Aloisio said. "So people are just skim-reading the headlines and no one is actually standing in line or on the phone and going, 'I want to read this whole story,' scrolling through a 1,500-word article." Summly, which D'Aloisio took a year out of school to develop, has received over a million dollars in funding from the likes of actor Ashton Kutcher and Zynga CEO Mark Pincus. 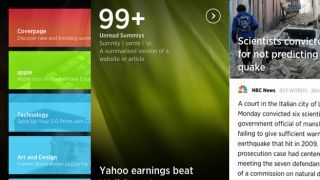 News Corp. is also on board after signing a deal to have the Wall Street Journal, The Times and other publications appear within the app. This is the second version of Summly. D'Aloisio says the first version was a demo, but this new iteration is ready for the mass market. Judging by the initial flood of downloads, it looks like he may be right.